OMAHA, Neb. (KMTV) — Early Friday morning, volunteers began taking calls from hundreds of people wanting to help those affected by the devastating floods. Erica Hernandez arrived 7 a.m. to volunteer. "It was heartbreaking, that could be us at one point , the animals--everything that's happening to the people losing their homes--the farmers, everything that's going on right now it's just heartbreaking," Fernandez said. Like several others who volunteered, Amy Robbins knew people who were directly affected. She says that's why she wanted to do what she could to help. "This is not a situation that's going to fix itself quickly," Robbins said. Robbins tells us she believes it'll take months before everyone who lost their home (or had significant damage) is able to recover. "When you think of the livestock and the crops that's gonna be something that's going to affect us for a couple years at least," she said. 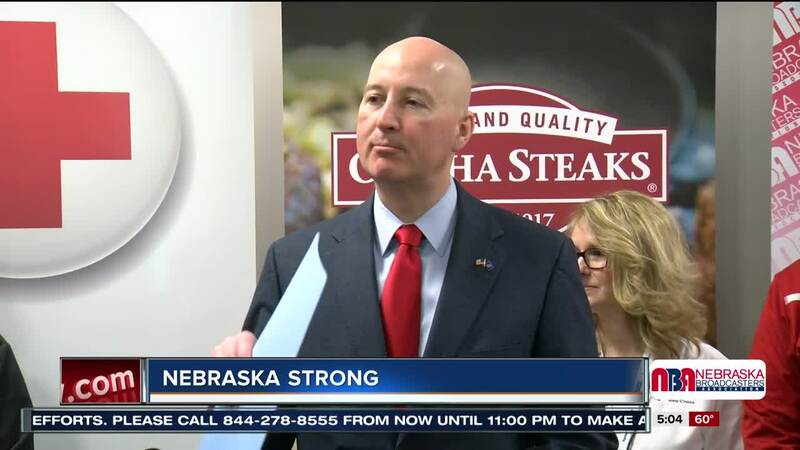 The American Red Cross, Omaha Steaks and the Nebraska Broadcasters Association hosted the telethon. Several elected officials including congressmen Don Bacon, Senators Deb Fischer and Ben Sasse as well as Governor Pete Ricketts attended. "We will rebuild better and bigger than we have before," Ricketts said. And it's gonna be with the help of the folks calling in this morning." The governor, and both senators took a few moments to take some calls. The American Red Cross has 11 shelters still open across Nebraska and Western Iowa. They had 338 stays last night. "We will go into the community and we will start feeding people that are trying to clean up their homes," American Red Cross Spokeswoman Erin DeWitt said. We'll provide clean up kits for them and financial assistance as deemed appropriate." And despite how rough it may have gotten for some families, the state is sure to remain Nebraska Strong. "We come together and we work together,"Congressmen Don Bacon said. As of 3:26 pm, more than $231,000 was raised by the campaign.